Jose's Page on Domino Games! Jose's Page on Domino Games in Puerto Rico! �Los dominos son para los boricuas, como los tostones y el mofongo, parte de nuestra herencia cultural! Playing Domino games is a very popular pastime in Puerto Rico. Dominoes are played in all circles in our society and played by people of all ages. Double Six - Dominoes for the entire family! The Domino Outreach Model takes its name in honor of Puerto Rico's favorite past time: Dominoes. "El Domino" is for Puerto Ricans and many Latinos, not simply a game of strategy or just a pastime, but also it is an activity around which community relationships are built and sustained. 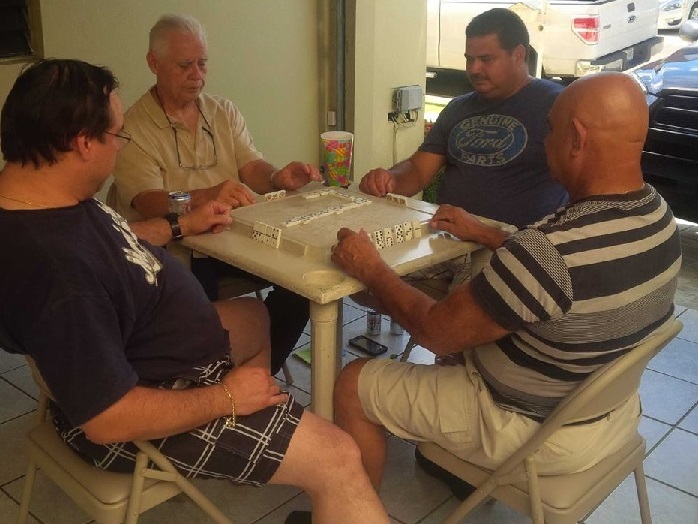 Dominoes are played in all circles in the Puerto Rican society by people of all ages. It is primarily known as a family game, since it is learned by children from their fathers, uncles, and grandfathers. Although it is a game usually played at home, it is also played where friends gather. Women play with men and children. It includes everybody. In Dominoes, it is interesting that one of the team strategies summarizes a community theme: "The best offensive strategy is to defend your partner." This game, easy to learn by children yet challenging enough for adults, is an important part in the communal life of many Latin American communities, both abroad and in the USA. It provides the perfect excuse for community members to sit for hours around the tables, combining competition with camaraderie, and it also provides the occasion for sharing information, through word of mouth, about important issues that affect the participants. Around the domino table, the players & families also interact, cooking, playing music together and just mingling; therefore dominoes becomes a social-familiar event, almost a ritual, in which all become refreshed and spiritually recharged. In the USA must be understood that many of these communities where the Domino is very popular, are underrepresented in the major media such as newspapers, radio, magazines and other outlets. This means that the main source of reliable information necessary for members of these communities will come from their own neighbors, family or friends--in other words, their personal and community networks they trust the most because they know them the best. In that sense Dominoes activity becomes a kind of newspaper/radio/gossip column and forum to pass ideas, concerns, problem solving, discussions, and even social page that complements, if not substitutes, the comercial media information. Noemi E. Valentin, July 31, 2005, Northampton, MA. Domino Set: The standard double 6 set with 28 bones. Players: Two or three play each by themselves. Four, two against two as partners, facing each other. The Deal: All bones are shuffled face down and each player draws 7 bones. In 2 or 3 player games the remaining bones are stocked together on the side and form the boneyard. Each player keeps his dominoes secret to himself only. This can be accomplished by holding 3 bones in a hand and 4 in the other, by placing them on special domino racks that hold them on their short end, or by placing them on their long edges on the table in such a way that only he himself can see them. In the first game of a match, the player who holds the double 6 starts the game. In 2 or 3 player games if the double 6 wasn't drawn, then the highest double starts the game. In subsequent games in the same match, the winner player of the previous game starts the game with any bone he wants, a double or otherwise. Optional opening variation: For games subsequent to the opening game in a match the winner player of the previous game can choose to start the game, or may pass the right to start to his/her partner. Whoever starts the game can play any bone he wants, a double or otherwise. This rule is optional and MUST be agreed by all players at the begining of the match. Bayam�n opening rule variation: Before the first game of a match, each player draws one bone. The player who holds the highest point scoring bone will lead the first game of the match, and does not have to open with the double 6. If there is a tie for the highest scoring bone, then those players who tied draw one more bone until there is a clear winner. The dominoes are then reshuffled and the winner of the initial draw can start the game with any bone he wants, a double or otherwise. Once the first domino is played, the next player to the opener's RIGHT plays a bone to the layout, draws or passes, and the game continues counter-clockwise. In Puerto Rico, due to our Spanish origins, most games are played to the right (counter-clockwise), instead of to the left as in most other games. There are exceptions, and a few groups play the game to the left (clockwise). The layout always has two open ends, each sprouting from one of the long side of the starting double. All bones played must be played to a free end and must match numbers. i.e. a 6 must be played to a 6, a blank to a blank and so on. If a player can't legally play a bone, (in 2 or 3 player games ) he must draw from the boneyard untill he can play. If the boneyard is exhausted, (or in 4 player games) he must pass. If a player has a bone on hand that can be played legally, he can't draw from the boneyard, and must play from his/her hand. Drawing from the boneyard in the hope of finding a more strategically sound play is illegal and considered "Trampa!". When a player passes, it is customary to knock one of his bones on the table as a signal that he is passing. Alternately he can signal the pass by saying the word "Paso" (Pass). The game ends when one player goes domino (plays his last bone) or the game is blocked (all players have consecutively passed). The player who dominoes, or in the case of a blocked game ("trancado") the player/team with the lightest hand, wins the hand. He (or his team in 4 player games) scores points equal to the number of spots on the bones left in the hands of all the players (including his partner, and his own in a blocked game). Usually a Domino Match is made of several individual games, and the first player/team to score the agreed in advance score wins the match. Typical agreed match scores are 100 or the more popular 200 points ("Doscientos"). A blocked game ("Trancado") is a game where each one of the players still has at least one bone in their hand, yet nobody can play. In most circles the winner of the game in a Blocked game will be the team with the fewest combined number of spots (both partners' spots are added together and compared to the combined spots of the other team). Yet in other circles, the player who blocked the game (the player who played the "Tranque") compares his points versus the oponent to his right. Whichever one of the two players who has the lowest count wins the game, and his team scores the spots left on all 4 hands. A blocked game where the "Tranque" (the last bone legally played) is the "Chucha" (the double-blank) is not considered a "Chuchazo". In this case the "Chucha" is the actual bone that blocked the game. In fact, it is very well possible that the team that blocked the game with the "Chucha" can actually lose the game since the other team may still have left points left in the hand. Fact: In a Blocked Game the sum of the spots of all remaining bones in the players hands must ALWAYS add to an even number. It is possible in a blocked game ("Trancado") for both players/teams to end up with the same number of points, a draw. Rules for a draw must be agreed before the game, for they differ from place to place. Pre-agreement on this rule before the game starts prevents arguments after. Option 1: The game is just a draw, and neither player/team scores. The holder of the double 6 (or highest double) starts the next game. Option 2: The player/team who opened that game (i.e. that was Mano in that particular game) wins the points in a draw and the player (in the winning team) with the lightest hand starts the next game. Option 3: The team that blocks the game wins. In a blocked game, the player after the one who blocked the game MUST draw ALL the bones in the boneyard (if there are any left). This is an optional rule. Since playing with 5 or more doubles is a disadvantage, in some circles if after the initial draw any player has 5 or more doubles, he can choose to show them and immediately that game is cancelled, the dominoes reshuffled, and a new game started. Nobody scores any points for a cancelled game due to this rule. When using a standard double 6 set with 28 bones, there are 1,184,040 different 7-bone combinations you can possibly draw. There are 4,410 ways of drawing 5 doubles (therefore the reason of the 5-Doubles rule). While the odds for a 5-doubles hand is 0.0037, 5-double hands seem to occur quite frequently. The most unlucky draw is the hand with 7 doubles, which's odds are 0.00000084, and thefore seldom happens. "Mano" - A single game. A dominoes match is made of several games (manos). The end of an individual game is refered to: "El final de la mano". "Mano" - The term is also used to refer to the player with the least dominoes. The player who (provided: he doesn't get a Pase [a pass], and he doesn't have a hung double) would win the game. If this player gets a pass, it is said that: he/she lost 'la Mano', and that the next person after him/her with the least dominoes is now Mano. "Chiva" - A term for "kept winless" or "shutout". When after more than a couple of games a team is still winless, that team is said to be on Chiva! When that "winless" team wins their first game, it is said that the team "broke the Chiva!". In the Chiva game (see below) a team needs to win 4 games in a row to win the match. "Chiva" - The term is also informally used as "skunk" in English. In games for points (100, 200, 500) a teams that shutouts the other (100-0, 200-0 or 500-0) is said to have given the other team a "Chiva"! This is something very hard to do in games for points (in games higher than 100 points anyway). "Chivote" - In some circles in games for points (100, 200, 500), the term "Chiva" is formally called "Chivote" (like "skunk" in English). "Chivote" stands for "Big Chiva", since a "Chivote" is hard to achieve in games of 200 points (or more). "Romper la Chiva" - To "break a Chiva"! When a team that is being shutout wins a game and scores points. "Chucha" - The name of the double-blank bone. "Chuchazo" - When the "Chucha" is the winning bone (the last bone played by the player who goes domino). There is no "Chuchazo" when the "Tranque" in a blocked game is the "Chucha". "Capicú" - When the winning bone can play on either open end of the layout. Doesn't apply when the winning bone is a double. "Dominao" - When the winning bone is a double and can play on either open end of the layout (in essense a sort of 'Capic�' of Doubles). "Trancado" - A blocked game. "Tranque" - It's the name given to the last bone legally played before a game gets blocked. "Ahorcado" - A hanged double. A double that can no longer be played because all the other 6 dominoes in that suit have been played. "Pase" - It's when a player or team can't play. When a player passes, it is customary to knock one of his bones on the table as a signal that he is passing. Alternately he can signal the pass by saying the word "Paso" (Pass). There are some games where there are bonus points for teams making their opponents pass (i.e. 200 Sure�o). "Puerta" - It's the last bone remaining for a particular number. i.e. When on one end of the layout you can only play a 3, and there is only one 3 left, the player holding that 3 is said to have "la Puerta del 3". "Trampa" - Cheating, making an illegal play. This game is for 4 players (2 partners) and the first team to score 500 points wins the match. The match is made of several basic games as described above with the addition of several bonus point situations described below. The winning team of the first game in the match scores a bonus 100 points, the winner in the second game scores a bonus of 75 points, 50 points in the third game, and 25 in the fourth. No bonus points are scored for winning the fifth game and on. If a game is won by a "Chuchazo" or a "Capicú" the wining team scores an additional 100 points in that hand. No bonus points are scored for winning with a Dominao (winning with a double, except potentially with the Chucha) or a blocked game ("Trancado"). Note of Carification: When is the "Chuchazo" not a "Capicú", or a Dominao not a "Chuchazo", and the Trancado with "Chucha"? There could be some confusion in situations around wining with the "Chucha", hopefully this will clarify these situations (send me an email if you have other combinations / variations to document them as well). Going Domino! : A win by playing one's last bone. (No bonuses, other than the initial 100, 75, 50 or 25 for the first 4 games). Capicú: A win where one's last bone can play on either side of the layout. (The winner gets an extra 100 bonus points). Dominao: A win where one's last bone is a double [1-1, 2-2, etc.] and it can play on either side of the layout. (The winner doesn't get any extra bonus points). Dominao outranks Capicú, therefore winning with a double doesn't get the Capicú bonus points. Chuchazo vs Capicú: A win with the Chucha that can play on either side of the layout only earns the 100 bonus points for the Chuchazo (and not the Capicú bonus). Chuchazo vs Dominao: This one is a tricky one! If the Chucha can play on both sides of the layout it could be consided a Chuchazo in some circles, and yet a Dominao in others. Therefore, the ranking of the Chuchazo & Dominao needs to be clarified and agreed to by the players prior to the start of the game, to avoid any confusion. A Trancado (blocked game) by Chucha is just that, a blocked game with the Chucha as the last bone played. This win is NEVER a Chuchazo, and there and no additional [Chucha related] bonus points. In some circles a 100 points bonus is given to the winning team if when the winning player goes domino (plays his/her last bone), both ends of the layout end with a "one". (i.e. the game is closed out with ones on each end). In other circles a 100 points bonus is given to the winning team of the first blocked game ("Trancado") of the match. The score keeper will place an asterisk next to the score of this win to ensure this bonus is not given more than once per 500 point match. This game is for 4 players (2 partners) and the first team to score 200 points wins the match. The match is made of several basic games as described above. 200 (Doscientos) is a very popular variation accross Puerto Rico. It can be played with or without bonus points. Some of the bonus points situations are described below. A team who makes their opponents pass scores a bonus of 20 points for the very first pass of the game. For any subsequent passes, the team who makes their opponents pass scores a bonus 10 points. Poker chips worth 10 and 100 points are used to keep track of the scores, and after the end of each game the score is rounded down to the closest 10th (i.e. a team that gets 37 points, actually scores 30 points for that game, or three 10-point poker chips). At the "El Senado" corner in the Juana Diaz center square, they use colored plastic jewels to keep track of the score instead of poker chips. Each jewel is worth 10 points. This variation is for 2 or 4 players as partners (see rules for 3 players below). The individual games are not played for points, only the win itself counts. The winner of a "Chiva" Match must win 4 games in a row (the winner must win 4 games to none, a "Chiva!"). If the player/team being shutout wins a game, he/they break the "Chiva" and the match goes back to 0 games for both player/teams, and they must restart the match again. i.e. if team A is wining 2 games to none and team B wins the third game, the match goes back to 0 for both sides. This "Chiva" breaking game doesn't count as the first win for team B. For 3 players, each playing for himself, the first player to win 4 games wins the match, and the "Chiva" is not broken until the last player being shutout wins a game. In other words, as long as there is at least one player being shutout, the match continues. Once a "Chiva" is broken all 3 players go back to 0 games and they must restart the match again. i.e. player A wins the first two games and player B wins the 3rd game. The current score is 2-1-0, and the match continues. If player A won the next two games he would win the "Chiva" match 4-1-0 (player C was shutout). But if player C wins game 4 then the all players go back to 0 wins and they must restart the match. This game is for 3 players, each one playing by themselves. A match is made of several basic games as described above, with a couple of special rules described below. Boneyard: The 7 doubles start off in the boneyard. The doubles are never drawn from the boneyard for play in the game. Opening: To select the player who will start the first game of the match, shuffle the doubles in the boneyard, and let each player draw a double from the boneyard. Highest double starts the game. Return all doubles to the boneyard. The game is played with only the 21 (non-double) dominoes, and without drawing from the boneyard. The player who starts the first game can play any bone of his/her choosing. Subsequent games in the match are started by the winner of the previous game. If at any time a player can't play from the dominoes on hand, he must pass. No drawing from the boneyard is allowed. The winner of each game earns the points left in the hands of their opponents, and are added to his tally. First player to reach 200 points wins. Blocked Games:There are never any Blocked Games in Doubles in the Boneyard. Because of the lack of doubles in the game, and therefore the lack of "hanging" doubles, every game will always play out and there will always be a winner. Variation:The player to start a game, instead of starting the game with any bone of his/her choice, draws a double from the boneyard as the starting domino for the layout of the game, and immediately plays a bone from his own hand. No other doubles are played on the layout. Upon the end of the game, the double returns to the boneyard, and the boneyard is shuffled prior to the next game. It is possible that the starting player may pass if he/she doesn't have a bone that can match the starting double, in which case, the player to his right gets the turn to start the game on the double already on the table. Alfonso Garcia decribes in his Gallinazo homepage a Domino Royal Rumble Game that was first discovered in San Lorenzo P.R., and it's known to be played as far as Guadalajara, México. Only the scorekeeper knows each player's scores and he reveals them and the looser after the 7th round is completed. Special caution should be taken when blocking the game because the player responsible for blocking the game, the one who played the "Tranque" must have the fewest number of points in order to win the set, otherwise his score for that round is multiplied by a 4. If you know of any other domino game variations played in Puerto Rico, I would love to hear from you and I'll add them to this page. Please send me an email with the details. Thanks for the visit.